To date, more than 5,000 staff members of the organizations in the study have shared their experiences and beliefs with respect to diversity, equity and inclusion in their organizations. 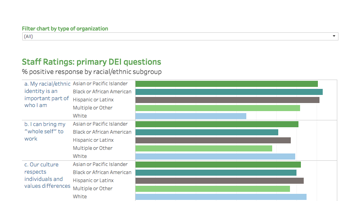 The staff survey collects perceptions about DEI practices, leadership, and discrimination; staff members’ intent to stay in the organization; and other factors. In the charts on this page you can view responses (in aggregate) to select survey questions as well as explore insights into how staff define diversity.